Peg dolls are an inexpensive and sweet toy - carved from wood and easy to adorn, they offer a way for just about anyone with the urge and some time to make a simple toy for their children. Below is a very basic tutorial; more of a documentation of how I made these ones than a singular way to go about them. They are made for imagination both in their making and in their use. These gnomes are all made with naturally dyed scraps from past projects. Their hats are naturally dyed 100% wool felt, and their clothing is a mix of cotton, linen, and silk. A great use for those extra small pieces of treasured fiber. The four gnomes pictured above were made to join us during our math lessons as Minus, Divide, Plus, and Times. They are very beloved, and make math awfully fun. 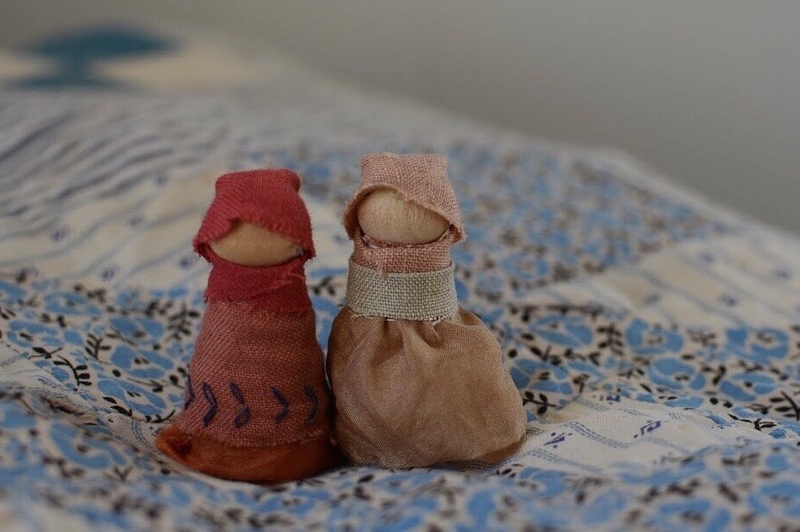 You’ll need a peg doll (this one is 2” tall, and you can use these or the straight-sided variation in the same way), a needle for hand-sewing, one glass head pin, thread in any color you’d like, small scissors, and wool felt and cotton and/or linen fabric. Begin by wrapping the body wrap around the doll. If you’re using a straight-sided doll, it will overlap easily. With the a-line doll like those I’m working with here, it will overlap at an angle. That’s okay! The cloak will cover this seam, so it does not need to be perfect. Pin the wrap in place, and use a whip stitch to close it together. Next, pin the cloak in place. The seam for the wrap should be hidden behind the back of the cloak, and it should overlap at the front. Use a few small stitches where the cloak overlaps to secure in place. Last, make the gnome’s tall hat. Pin the hat around the gnome’s head. It doesn’t need to be in its final position now - you will be removing it to sew and putting it back on later. Again using a simple whip stitch, begin seaming the hat by stitching along the edge where the felt overlaps. After the first few stitches, you can take the hat off to work more comfortably. Continue pulling the hat closed as you go, allowing it to overlap and form the signature tall, pointy gnome hat shape. Tie a small knot at the top to secure, and tuck your thread down into the hat to hide the end. Place a small amount of glue around the inner perimeter of the hat. Place it on the gnome’s head so that the seam of the hat is at the back. Below, an alternative way to dress your dolls. These are made in nearly the same way, only after the cloak is sewn on, it is brought up over the head and stitched at the back to make a bonnet. I also gave them silk skirts and a little extra flourish, but you could add a second cloak around their shoulders, or leave them as is.